Eventually I found the Incase Origami Workstation, which doubled as a protective cover for the keyboard, and then folded out into a stand for the iPad. This was a perfect setup for me at the time, and it got me writing more on my original iPad and early on with my iPad 2. Unfortunately, I’ve lost that lovin’ feeling. It’s been a while since I’ve really had a need to try out an Apple keyboard, as there is absolutely no shortage of keyboard cases out there for every model of iPad, and I am a Windows user on the desktop, so there is no reason for me to use an Apple keyboard there. However, I noticed an Apple Smart Keyboard for the 12.9″ iPad with an Open Box discount at BestBuy a few days ago, and decided to take advantage. I had heard polarizing viewpoints on this accessory for over a year, as people either seemed to love it or hate it. I figured, why not give it a try at a little cheaper price and see how it goes after more use than I can stand looking at a demo at the Apple Store. I guess I’ve already tipped my hand, but I definitely fall in with the “hate its.” I honestly can’t understand the design of the “Smart” Keyboard on any level. It’s as if Apple stood by and watched Microsoft make early mistakes with the original Surface and Surface Pro (most, if not all, of which have been corrected since) and didn’t learn ANYTHING from them. The biggest knock on the original Surface Touch Cover keyboard was that no one wanted to type on fake keys with poor response. Their newer Type Covers reflect how much they learned from user feedback, and responded with appropriate design changes.They also evolved their keyboard designs QUICKLY, which is key. Now Surface users have a couple of really solid mobile keyboard options because of it. Unfortunately, using the Smart Keyboard makes me feel like Apple decided to re-invent the wheel, and ended up making something that works and responds like an original Surface Touch Cover. Too bad they effectively knocked off a colossal flop of a keyboard. All kidding aside, I do have what I feel are legitimate gripes with this accessory. The fabric covering acts as a barrier that dampens the feel of the keys. I understand that Apple must have had some reason why they felt this design was superior. However, MANY other keyboard manufacturers have been making iPad keyboard cases with plastic keys for years and designing them work without issues for seven years now. The fabric seems like a solution in search of a novel problem that unfortunately causes other problems of its own. Another issue with the Smart Keyboard is that it leaves the back of the iPad exposed when folded up. Again, this design decision seems to have been made in the interest of thinness, rather than functionality. 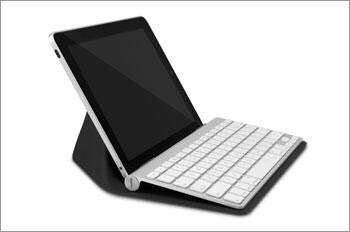 Now, I have had and used devices like this on past iPads, such as the Logitech Ultrathin Keyboard Case for the iPad 2/3. I really liked that case, because it was not only thin and light, but it gave solid aluminum coverage to one side of the iPad. More importantly, it also delivered a great keyboard with amazing battery life. You see, that’s the key to this situation. If you are going to take something away or have a trade-off of some kind in your design, you need knock it out of the park in the areas where your accessory is focused. If the Smart Keyboard served up a best in class typing experience for the iPad, I would absolutely accept the trade-off of no rear protection, the way that I did with past keyboard covers. Unfortunately for Apple, it isn’t a best in class experience. Not even remotely close. For me, the real issue here is Apple’s overriding obsession in all areas of their laptop and mobile business- thinness. No device can EVER be too thin or too light, even if that comes at the expense of battery life, or in this case, outright functionality. The only thing that the Smart Keyboard gets right is being thin, and that just isn’t all that compelling. The bottom line is that the response and feel of this keyboard is really below average, and doesn’t hold a candle to the third-party competition on their own devices, much less anyone else’s. This Smart Keyboard is going back to BestBuy to become an Open Box special for another sucker as soon as I can get it there. Again, I just can’t believe that this accessory passed through the QA and marketing departments at Apple and made it to market the way that it currently stands. Apple touts the iPad Pro as a competitor to the traditional laptop for the modern student and professional, but that kind of work often requires a high quality physical keyboard. For someone like me who is actually using their Pro for just such tasks, the Smart Keyboard is more of a hinderance than a help. It doesn’t hold a candle to my ZAGG Slimbook, even with all of the additional size and weight that keyboard case adds. I’ll take the better keyboard and increased flexibility every day of the week and twice on Sunday, thank you very much. Unfortunately, Apple’s quest for thinness isn’t limited to the Smart Keyboard. Their Magic Keyboard, the follow up to the original Wireless Keyboard that I mentioned at the beginning of this article, is also super small and light. Thankfully, it is a MUCH more sucessful keyboard than the Smart Keyboard, offering a far superior typing experience. 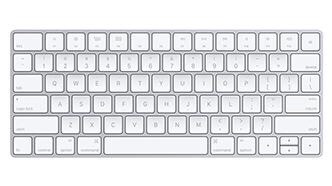 However, most of the complaints that I came across online had to do with wanting a larger version of the Magic Keyboard, with bigger keys and a little more space. The keys also have a very low profile, which just isn’t necessary on what is supposed to be a full-sized wireless keyboard. Again, we see design decisions made for the sake of thin and light before device-specific functionality. I would love to see Apple go back to the drawing board and create a keyboard case that is truly worthy of the iPad Pro moniker. They don’t have to get rid of the Smart Keyboard to do it, either. By all means, keep that one around for those who want it, but how about at a more reasonable price going forward. Then take a page from Microsoft’s book, and release another version that is geared toward greater productivity, even if it is a bit bigger and weighs a little more. A keyboard case with the “soul” of the old Wireless Keyboard and half of the portability of the Smart Keyboard would absolutely set the standard for the iPad Pro. Come on Apple. Myself and others like me are ready and willing to fork over our cash for this bad boy. How about giving us something worth spending it on this time. Do you have an opinion on Apple’s Smart Keyboard? As widely as I’ve seen the opinions on this accessory differ elsewhere, I am sure many of you will disagree with me. That’s fine. Tell us why! Please let us know in the Comments section below, on Flipboard, or on Twitter @iPadInsightBlog or @jhrogersii. We would love to hear from you. I purchased an Apple Smart Keyboard for my iPad Pro 12.9-inch. Several months after using it, I began to get a ‘this device not compatible’ error. The only solution offered was to reset the iPad Pro. That fixed it — for about 24 hours. I swtiched to the Logitech K811 Backlit BT Keyboard. Great key action. Rob- I actually wrote this review on a Logitech K811. I reviewed this keyboard at iSource when it came out, and have used it with several devices since. You are right on the money about action. This keyboard is a smooth and easy to type on as any I have ever used. I also love how the keys are curved inward to perfectly fit your fingers. I would recommend the K811 to anyone looking for a good Bluetooth keyboard. I am curious. What did you think of the keyboard on the Smart Keyboard before it failed you? Thanks for trying it out so the rest of us don’t have to! I read so many complaints about apple’s keyboard that I didn’t get one when i got my iPad Pro. I actually used your set up: the origami work station and old applre wireless keyboard combo. The velcro started failing though after several years of use, and the wireless keyboard lacks buttons for some of the shortcuts available from iOS9 forward, so I considered the Logitech create, which has gotten great reviews for the smaller version that fits my 9.7″ pro, not so much for the larger version. But I finally decided I don’t want my ipad in a case so often, and the Create and other cases are said to be clunky to take on and off frequently. Plus, they all present the ergonomic ‘laptop neck’ issue inherent in laptop set ups. (That also applies to the Origami wireless keyboard and apple magic keyboard canopy set up.) One of the beauties of the ipad is that you can raise it to a higher, healthier level than any laptop style set up allows. What I wound up with is the logitech keys to go and a little portable stand that raises the ipad higher than any case would allow. I set that on my shoulder bag or a book or a lap desk when at home. You may not like it because it too has those fabric covered keys, but they don’t bother me and in fact they make typing silent, which is important in several of my uses. And the KTG has those extra function keys, it was cheap ($15 refurb, and often available around $30 on sale via best buy or amazon) and it’s the thinnest , most portable keyboard I know of, which is also handy in my uses. I just keep my ipad in its own cheap Moko case/stand and use it with the portable stand. Have you looked at the logitech k811? Lots of apple fans love that one, as it’s backlit and lets you easily switch among 3 bluetooth devices (e.g. Phone, laptop/desktop, ipad). Right now another popular logitech K480 is on sale for $25. It has a slot for the ipad but is said to be noisy and not backlit. 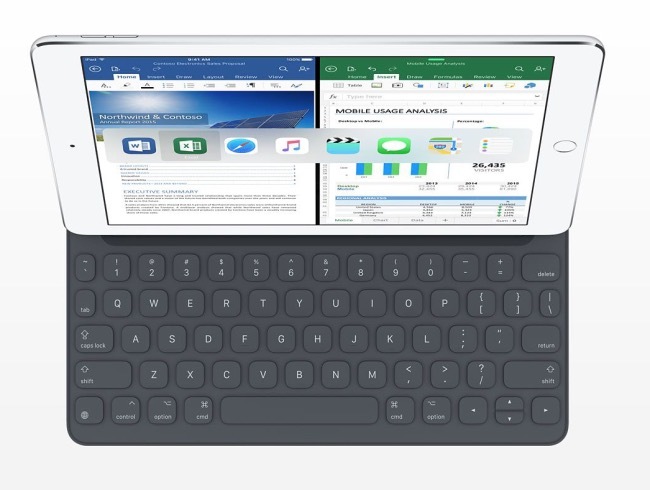 My SO is considering getting an ipad 12.9 and wants a keyboard that holds the ipad at any angle, which none of the keyboards mentioned here can do. She’s going to try out models by Zagg and Brydge. If you get to try those out , please write about it! They’re bluetooth and don’t use the smart connector, but I’ve had no problems using my BT keyboards on any of my ipads. Thanks again for covering this! You make a lot of good points BC, and it sounds like we share a lot of similar conclusions about keyboards. I came to much the same conclusion about the Logitech Create. If it weren’t so hard to get the iPad in and out, I would have liked it. The keyboard is good, and it’s actually lighter than the ZAGG Slimbook. As for the Keys to Go keyboard, I’ve never tried it, so I can’t really speak to it. However, I don’t necessarily hate covered keys. I just don’t like it when the covering gets in the way of use. If that isn’t the case with the KTG, then I wouldn’t have a problem with it. I actually typed my review and am typing this comment on a Logitech K811. It is one of the better and more versatile keyboards that I have owned. I usually keep my iPad Pro in a ZAGG Slimbook keyboard case, but my family and I are on vacation this week. I have my iPad in a thinner case for normal use, and then just pull out the keyboard when needed. I have had the K811 since I wrote a review on it at iSource.com several years ago when it was released. It has never failed and I still use it often. I highly recommend it. As I said earlier, I own a ZAGG Slimbook for the 12.9″ iPad, and have used it for over a year now. I really like it personally, but I could see where others might not. I want a great keyboard that is always with me when I use my iPad at work, I like that the angle of the iPad is fully adjustable, and also really like that you can undock the iPad and use it separately without removing anything. However, the trade-off is that it’s heavy. REALLY heavy. It adds a lot of bulk and weight to the Pro. I would recommend picking up one at BestBuy or other local outlet and trying it out for a few days. Then your SO would have the option to return if it doesn’t work out. Let me know how it goes! Hans- Thanks for responding. I always like to hear from those who have a different take or opinion on a product. I can actually see your point, and if the keyboard had operated closer to what I prefer and am used to, I may have held onto it as a secondary option. As you point out, the Smart Keyboard is radically thinner and lighter than any other keyboard case for the Pro right now. My main case is a ZAGG Slimbook, which sits at the polar opposite extreme. It is quite heavy and bulky. I’m good with that because of how well it performs, though. What I wish we had is an in between option. Something that is thinner and lighter than the Slimbook and Logitech Create, but provides full device protection and is a little more functional than the Smart Keyboard. Unfortunately, nothing really exists in that space right now. Like I said in the article, I would love for Apple to go back to the drawing board and come up with another take on this. There’s no reason why they can’t have more than one keyboard case to fit different needs and use cases.